BECOME A SPONSOR! If you are interested in sponsoring this event in support of CRK and our fight for clean, safe water, please view our sponsor packet — or contact Becca Klein. 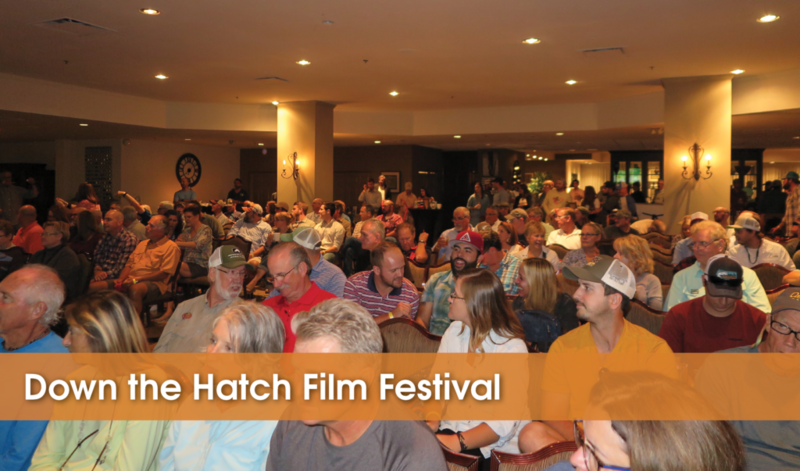 On October 4, 2018 we’ll be heading over to The Metropolitan Club in Alpharetta from 6:00 to 9:00 PM for the 5th Annual Orvis Down the Hatch Fly Fishing Festival. We are thrilled to be partnering with our friends at Orvis and SweetWater Brewing Company again for this night of fresh films, a silent auction, cool swag and giveaways, food and heady brews. The night will start with the Quality Hooch Pre-Party where guests can enjoy food, free happy hour courtesy of SweetWater Brewery, silent auction, a BOTE raffle (package valued at $2,000) and a variety of vendors, fly shops and outfitters who will be showcasing their goods. Come mingle with CRK, the good folks at Orvis, fly fisherman, and other outdoor enthusiasts who are committed to a forever clean and sustainable Chattahoochee River. The film festival will begin around 7PM. Seats are limited, so get there early or else it’s standing room only for the night! We’re showing the best fishing films from around the world to get you revved up and ready for the fall. And don’t forget the silent auction! Check out Orvis Atlanta on Instagram for more details on items. Auction items include sweet new Orvis equipment and awesome gear from our Down the Hatch friends and partners. Entry for the BOTE raffle is included in your ticket price, so kick back and enjoy the show but be ready to sit on the edge of your seat come raffle time. We will be selling additional raffle tickets at the event so bring your cash! 1 for $5, 5 for $20, or an arm’s length for $100. In spring of 2016, The Orvis Company, Sweetwater Brewing Company, Chattahoochee Riverkeeper, and fly-fishing guide service River Through Atlanta, decided to combine their efforts with the “Quality Hooch” campaign to fund water quality monitoring in the Chattahoochee River. To date, we have raised nearly $20,000. For the 2018 Quality Hooch Program, fundraising efforts will go toward CRK’s BacteriALERT project. BacteriALERT will take place within the Chattahoochee River National Recreation Area (CRNRA), which receives approximately three million visitors annually (including anglers, kayakers, swimmers and more). The CRNRA encompasses 48 miles of the Chattahoochee River from Lake Sidney Lanier’s Buford Dam to Atlanta; this section runs through the highly urbanized greater metro Atlanta region.